vacancies through online using NFL official website www.nationalfertilizers.com. Application forms accepted through online only from 15-11-2017 to 15-12-2017. Candidates are required to send hard copy of application forms before 27-12-2017. Minimum qualifications required is B.Tech/ B.E/ B.Sc Engineering Degree in relevant discipline are eligible. Maximum age limit for Manager Jobs is 30 years and for Engineer & Sr. Manager Jobs is 45 years. Application fee for Engineer Posts is Rs. 700/- and for Manager, Sr. Manager Jobs is Rs. 1000/-. See the notification for Pay Scale details. Full details regarding Application process, Application fee, Age limits, Selection Process, Pay Scale details of National Fertilizers Limited NFL Engineer, Manager, Sr. Manager Jobs Recruitment Notification are given below. 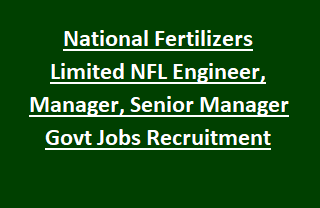 Total Vacancies available in National Fertilizers Limited NFL Recruitment are 65 posts. 2. Manager (Electrical): 08 posts. 3. Senior Manager (Materials): 03 posts. Engineer Jobs: B.Tech/ B.E/ B.Sc Engineering Degree in Chemical/ Mechanical/ Electrical/ Instrumentation Engineering from recognized University. Manager: Engineering Degree in Electrical Discipline with 60% marks (OR) AMIE in Electrical Engineering. Sr. Manager: B.Tech/ B.E/ B.Sc Engineering from recognized University and Post Graduate Diploma in Material Management or MBA. Maximum age limit is 30 years for Manager Jobs. Age limit for Engineer & Sr. Manager Jobs is 45 years. Candidates fulfilling eligibility criteria will be shortlisted for Interview. Final selection will made on the merit basis of candidate performance in Interview. No Application fee for SC/ ST/ PwD/ ExSM/ Departmental Candidates. Candidates fulfilling the above eligibility criteria should apply using the NFL official website www.nationalfertilizers.com. Online Application link for NFL Recruitment vacancies available from 15-11-2017 to 15-12-2017. Candidates are required to send hard copy of applications before 27-12-2017.